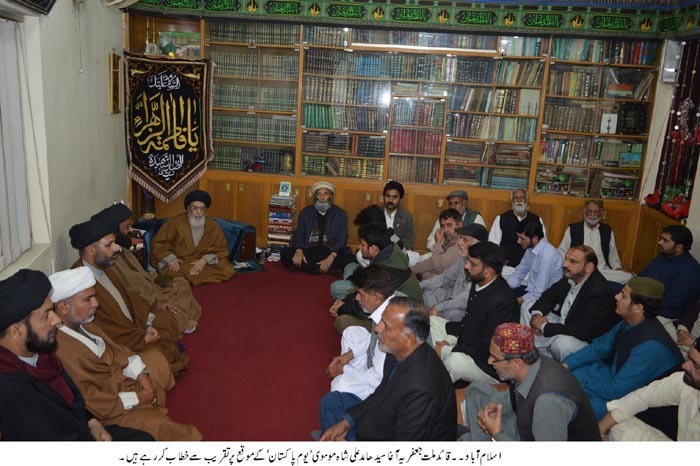 ISLAMABAD, March 24: The Patron in-Chief of Supreme Shia Ulama Board and Head of Tehreek e Nifaz e Fiqah Jafariya Agha Syed Hamid Ali Shah Moosavi has said that the responsibility of the New Zealand’s tragedy lies upon American think tanks and American Presidents right from Bush to the existing president Trump who created Islamophobia after the elimination of Soviet Union while Indian Chankiyai thinking also supported and participated in its growth. The American 9/11, London’s 7/7 and Indian Mumbai and Pulwama dramas were part of the same conspiracy. The world of non-believers is united against Islam while the followers of Islam have disintegrated and OIC has lost its way. United Nations must declare RSS as a terrorist organization which has also announced a deadline to eliminate Pakistan from the face of the earth or otherwise UN must exclude peace from its charter. In its Istanbul meeting, OIC must have passed a resolution against the perpetrators of Samjhota Express, Government of Pakistan must demand from India to handover those responsible for the tragedy. The spirit of the people and the Prime Minister of New Zealand is the worth following examples of humanity and compassion during this century while also a slap on the faces of Muslim rulers bent upon falling each other. Pakistan was created to stay forever, and no power can undo Pakistan or its ideology which is protected by the Hussaini and Zainabi spirit. The sacred character of Sani e Zahra Hazrat Zainab bint-e-Ali (A.S) is a beacon of light for the oppressed world. He said this while addressing to a program held on the occasion of Pakistan Day. Agha Syed Hamid Ali Shah Moosavi noted that after the defeat of Soviet Union, the Zionist scholars presented the Islamic world as a new opposition to keep American people charged. The chief of International colonial world America and her stooges provided intellectual ground for the enmity towards Islamic Ummah, American scholar Sheraton Hunter mentioned in West and Islam that Islam is the new candidate for enmity which can fill the gap after the fall of Communism and then we saw that the western civilization attacking the Islamic world. He said that the sole purpose of 9/11 drama was to promote hate against Islamic world therefore, on one hand hate was spread while on the other, the militants created against Soviet Union were given different Islamic names and declared terrorists to spread terrorism in the world using western ammunition and resources. During this campaign, the shrines of Islamic heroes and other historic signs were also destroyed. Quaid e Millat e Jafariya Agha Syed Hamid Ali Shah Moosavi said that besides condemning those spreading Islamophobia, OIC must have openly condemned the terrorist ideology ruling India and Isreal. The purpose of creating OIC after the burning of Masjid e Aqsa was to unite Islamic world and formulate strategy against Muslim Ummah however, it is tragic that India that is the eternal enemy of the biggest Islamic country and the only nuclear power Pakistan, was invited as the guest of honor in OIC’s foreign ministers meeting in UAE which shows the dilemma of Islamic Ummah. He said that United Nations has been working to serve the interests of three-evils i.e. America, India and Israel which is proved by holding the plebiscite to disintegrate Islamic states of East Timor and Sudan and not doing the same for the people of Kashmir and Palestine despite passing dozens of resolutions as it maintains different standards for Muslims and Non-Muslims. Agha Syed Hamid Ali Shah Moosavi stressed upon the government to raise Samjhota Express case in the International Court of Justice (ICJ) and highlight it through its ambassadors. If the FIR of incidents occurring inside India during the tenure of Nawaz Sharif, can be registered in Gujranwala, then why cannot the FIR of Raheela Bano be registered against burning of Pakistani citizens.